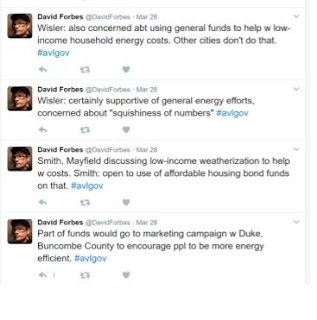 Asheville Unreported: The Great Bait and Switch: Affordable Housing or Energy Bond? If they won't cover it, we will. The Great Bait and Switch: Affordable Housing or Energy Bond? Last week before the City's last budget meeting, we wrote the following article. However, at the budget meeting on Tuesday, April 11th, it appears there may have been a change of heart. The amounts have been diminished and perhaps the source of the funding. We won't know the final outcome until the budget is released in May. Either way, this information is still relevant and one to track as the city goes back and forth on its budget plans. Last November, voters approved a $74 million bond package of which $25 million would be dedicated to Affordable Housing. When the City promoted the $25 million affordable housing bond it stated that $15 million would go to repurposing city-owned land for affordable housing and the other $10 million would go to the Housing Trust fund. Well, it looks like the City Council is already going back on what it promised during the 2016 summer campaign for the bonds. 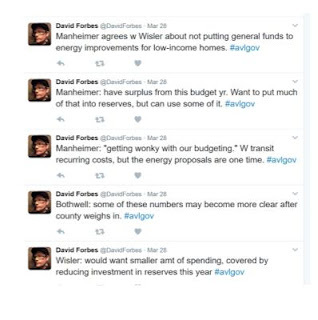 At the budget worksession held on March 28th, the City Council, within a series of quick moments, decided to fund the Energy Innovation Task Force's recommendations out of the Affordable Housing Bond fund money. Thus, the bait and switch of affordable housing for energy. The original request was for $1.1 million but certain council members were opposed to funding that out of the general operating fund this year. Julie Mayfield, who championed this request on behalf of MountainTrue (Co-Director of Mountain True) at the first budget meeting, dropped her request to $500,000. One of the main arguments against the bonds was the "flexibility" of these bond monies and how they can be used. In fact, as long as the use is within the same "category," i.e., "affordable housing" they can be used in a myriad of ways including consulting fees. Essentially, the concern is potential misuse of funds by using the funds on projects that were not enumerated to the public at the time of the bond promotion and voting. The mayor confirmed that, within each given bond category, it is “technically possible” to repurpose monies for projects other than the ones officially listed in the bond questions, but said, “A lot of people are concerned about this and I wish there were some way that we didn’t have that flexibility.” She said she stands by her position that the bond moneys should go directly to the specified projects, with no substitutions. Implement education and training for City staff, building professionals, HVAC contractors, building owners and the general public (8 & 10 on Clean energy framework). Encourage voluntary, quantifiable efficiency retrofits in privately owned commercial buildings (Better Buildings Challenge as extension of existing Workplace Challenge). Promote program offerings from EITF with City employees via education, outreach and support/remove barriers. Asheville Unreported reached out to Cynthia Aiken, Assistant General Counsel for the State and Local Government Finance Division about the use of bond funds. The City of Asheville had to apply to the state for approval to conduct the bond referendum and it is the State LGC that will issue the bonds for sale. We asked her about challenging the city's use of bond funds and if these energy task force recommendations would be contrary to the bond issuance. We also requested information about the City's due diligence in reporting. 1. During the course of the City’s spending of the bond proceeds on the Capital Project(s), the City Finance staff would be providing interim reports to the City Council at a frequency requested by the Council (the City staff would be able to inform you as to what frequency is required, whether monthly, quarterly, etc.). 2. The City will submit annual audited financial statements to the Local Government Commission, due October 31 each year. The audited financial statements will include schedules (in the form of a Capital Project Fund summary) for the City’s Capital Project expenditures, including those financed by the bonds. 3. The City is also subject to the reporting requirements of the Municipal Securities Rulemaking Board (MSRB) EMMA system (Electronic Municipal Market Access, an online database), with certain financial disclosures required by January 31 each year. As to your question about the specific uses of bond proceeds, the proceeds are to be spent in accordance with the purposes specified in the voter-approved bond referendum and in the Bond Order(s) adopted by the City Council. Your specific question should be addressed to the City of Asheville attorney, who will advise the council members on what Capital Projects may be funded with the bond proceeds. The City’s bond counsel should advise the City staff to ensure the bond proceeds are spent in accordance with applicable law to maintain the bonds’ legal and tax-exempt status. The Local Government Commission would defer to the City’s legal counsel on the legality of specific projects and uses.